When the original Citroen DS appeared back in 1955, it represented a revolution in car design. Although the DS3 didn't offer quite such a leap at its launch in 2010, it did mark something of a return to the French company's quirky roots. 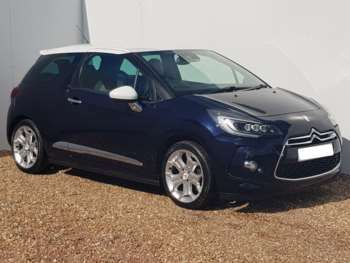 Stylish and fun to drive, but still affordable to run, the DS3 comes as a 1.6 HDi diesel in 110 and 90bhp versions, a 1.4 VTi 95 and 1.6 VTi 120 plus a 1.6 THP turbo petrol with a 150bhp. 2011 saw the addition of the DS3 Racing model with even more extrovert exterior trim and a turbocharged petrol engine delivering 207bhp. All cars are three-door hatchbacks with a contrasting colour roof giving the car its unique style. There are three standard levels of trim, DSign, DStyle and Dsport, plus the Racing. The roof comes in a choice of four contrasting colours, and the mirrors and rubbing strips can be personalised in colours or chrome. The customisation options continue inside, with six different dash finishes and a wide choice of fabric and leather upholstery. There are even five gear knob finishes! Inside there are generous levels of kit and some smart design touches with a quality feel to the trim. A used DS3 is around the same size as a Ford Fiesta but has good levels of interior space and a relatively generous 285-litre boot. The used Citroen DS3 has firm suspension – perhaps a little too firm for some – and sharp steering giving it a sporty feel. There's a wide range of seat and steering adjustment, so you should be able to find a decent driving position. Whilst the diesel and VTi models offer good everyday performance, the THP will take you to 60 in 7.3 seconds and on to 133mph. The Racing will do the sprint even quicker and has uprated suspension and brakes to cope with the extra power.